As a young girl, like many other girls around the world at that time, my world was full of the adventures and the food of the characters of Enid Blytons books. While puddings, custards and cakes were a regular part of my growing up, pies were not commonplace at that time which probably fuelled my imagination even further at a time when I did not enter the kitchen except to ask what was being cooked. Later on in life when I did come across a pie recipe, it seemed daunting enough to prevent me from making it. And then I saw all the lengthy explanations being written about the techniques, tools and methods for creating the perfect pie crust which I must say made the idea of making a pie even more formidable than I had originally conceived it to be. And then began my journey of deconstructing and demystifying pie making only to learn that making a pie is not rocket science as it is made out to be at times and as far as you follow a few simple rules of weighing the ingredients carefully, keeping the ingredients cool, using little flour for rolling out the dough and handling the dough as little as possible, you are good to go and can create a wonderful, satisfying, creatively fulfilling, good looking pie. Apples coming in from Shimla and Kinnaur are in season in India and they are juicy, fresh and sweet. Although, a mixture of apple varieties is generally used for an apple pie which also includes the tart granny smiths, I decided to use these local varieties of apples which I had on hand. During the cooking procedure, as the ingredients began forming into the end product, I knew I was in for a good pie but had no idea about how good it was going to be. 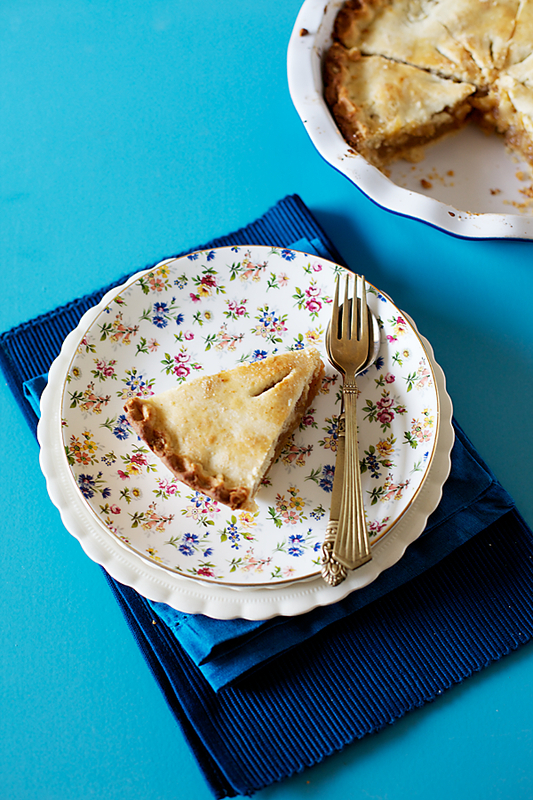 I’m not a pie person when it comes to desserts, but this pie with its impossibly tender, flaky crust and the gorgeous tart, sweet and smooth filling created one of the most delectable culinary experiences and this pie totally won me over. I kept experiencing its magic, spoon after spoon as I began to shoot and I couldnt stop myself from calling up Ro and asking him to come over to taste this wonderful pie (something which I never ever do). I was a bit skeptical about him going overboard with this as like me he is not a pie person too, but when he said that this was the best pie he had ever had and went in for a second helping, I knew this was a winner! If this was the kind of pie that the girls in Malory Towers and St Clare’s spoke about, then I wouldn’t mind considering to trade my place with them and lead the care free life of a dreamy eyed school student once again and ofcourse to get a slice of this heavenly pie! You could use a variety of fresh apples here or use only one variety. Use two or more granny smiths if you want a pronounced tart flavour. In a bowl, put in the flour, salt if using, baking powder, soda and sugar and mix well with a whisk. 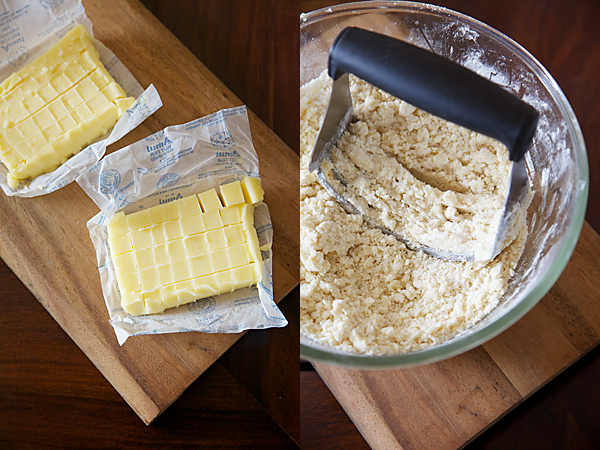 Mix in the cold butter and using a pastry blender or with your hands, cut the cold butter into the flour by rubbing the butter into the flour until the mixture resembles bread crumbs. You could also use a food processor to do the same. Mix in the yogurt and knead gently until the mixture comes together to form a ball. Use a few drops of cold water if the pie dough feels a little dry. Don’t knead the dough for more than a few seconds. Cover the pie dough with cling film or foil and chill in the refrigerator for 30 minutes to 2 hours. In a medium sized saucepan, place the apples, sugars, lime juice, cinnamon powder and the water, reserving 2 tbsp of water for later use and cook on medium heat until the apples are cooked through. 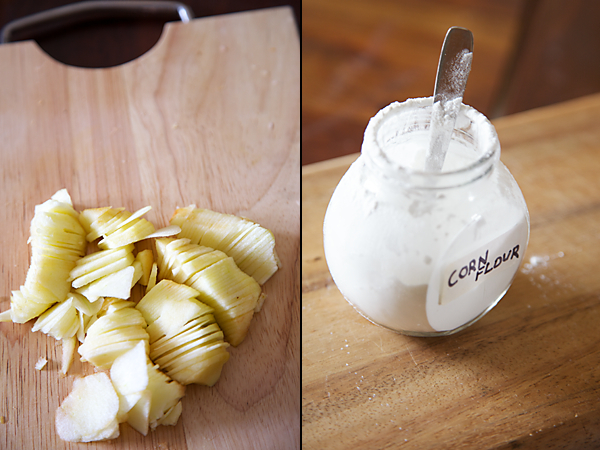 Once the apples are cooked, mix the cornflour with the reserved water to form a paste and add this paste into the apple mixture. Cook on low heat until the liquids thicken and form a smooth mixture. allow to cool. Pre heat the oven to 200C/430F. 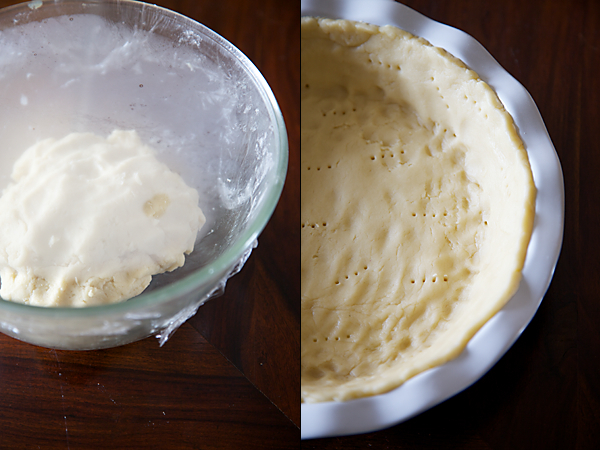 Bring out the pie dough from the refrigerator and roll out two-thirds to line an 8” (20 cm) regular pie dish. Make sure that the dough is quite cool when you roll or else it would tear. Prick with a fork all over and place in the refrigerator for ten minutes. Place the pie dish in the preheated oven and cook for 15 to 20 minutes until the pie base is lightly golden brown in colour. Remove the pie dish from the oven, cool for a about five minutes and place the prepared pie filling over it. Roll out the remaining pastry and cover the pie. Seal the edges over the already browned prebaked pie dough by making a fluted pattern with your fingertips or with the help of a fork. 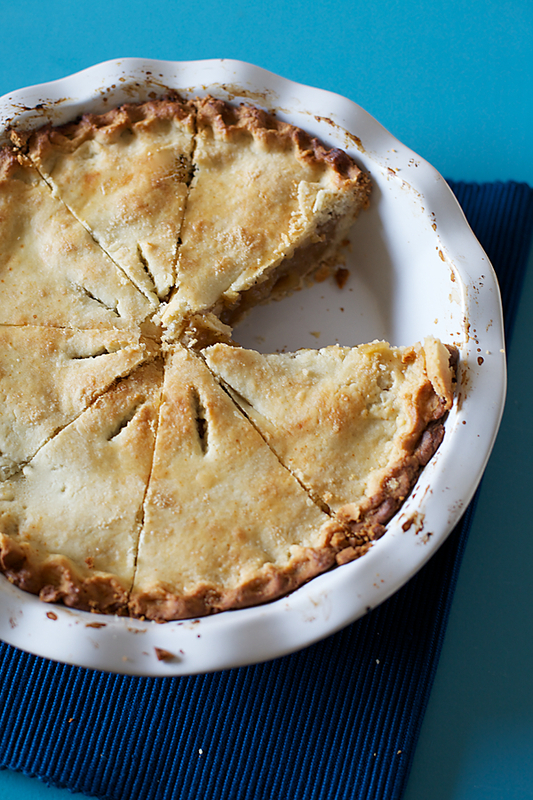 Make some slits in the centre of the pie for air to circulate while the pie bakes. This also prevents the filling from turning into a soggy mess. Give the pie a milk wash, by brushing the top of the pie with milk, sprinkle some sugar all over and bake again for about 20 to 25 minutes, until the pie is golden brown. 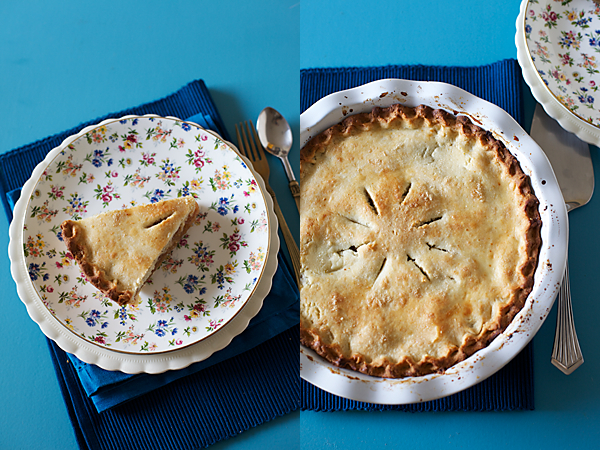 Cool completely before cutting and serving a slice of this gorgeous pie! Beautiul post Anu! Apple Pie is Amith's favourite!! You didn't mention how good your home smelled while the pie was baking! isnt that the best part? :)) And yeah..did i tell you how much i love that plate? very english! very country! complements the earthy apple pie perfectly! Good job as always! 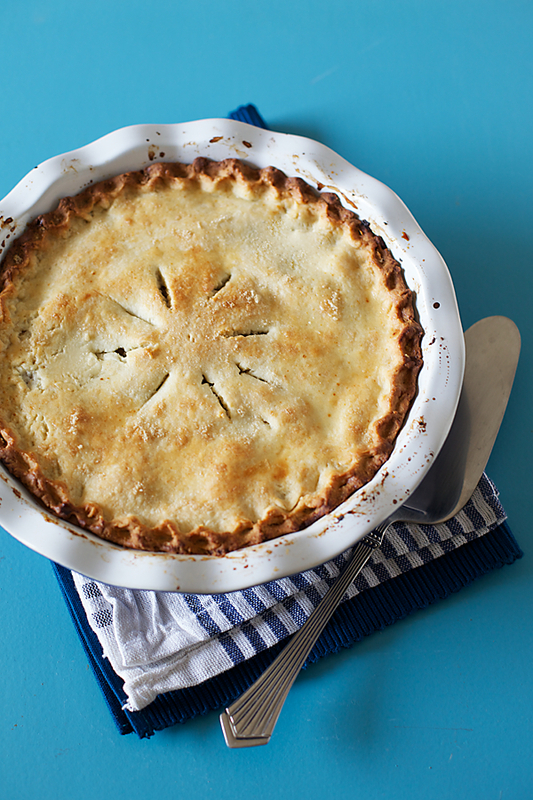 your apple pie looks just delicious. 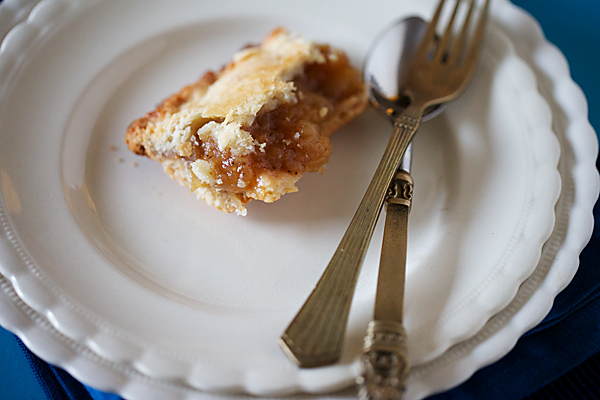 My husband is fan of desserts made from apples and specially apple pie. Whenever I make apple pie, he cant stop eating it with vanilla ice cream. I learned making pie crust from so many internet sources and baking books. Beautiful photography. this pie looks too very inviting. i am planning to make it. Can we replace brown sugar with regular sugar? Hi anu, I was looking for it since ages. I am certainly going to try that. The plate is beautiful. Love you for the recepie. Anushruti, the pie looks out of the world and brings back such strong memories of Enid Blyton for me too. I've been too busy to bake for the last few months but this is just calling out my name. I intend to bring out a stack of my old copies of Enid Blyton books and enjoy it with them. I don't have brown sugar, when I went to the supermarket to check, they had "Demerara brown sugar" and nothing else. Will that do or should I continue searching? Vasumathy: Yes you can, but the brown sugar gives a lovely flavour to the pie.Fab India stocks very good quality brown sugar. If you can get it please use it if not use regular sugar. Poornima: That sounds fantastic! You can use demerara sugar but make sure it is of good quality. At times, the sugar coated with bitter caramel is sold as demerara which can leave a bitter after taste. Try using the brown sugar or demerara from fab india or 24 letter mantra store. I have been a silent reader of your blog over the years and I have to tell you that I enjoy all your recipes and have also tried many many recipes from your site. I have been on the look out for an apple pie recipe (egg free) and have not been able to find a good one, but on seeing this recipe, I simply jumped with joy. I will definitely try this out very soon. Keep up the good work and looking forward to a lot more sattvik recipes! Lovely post and so delicous, brings back memories of having this at my friends christmas party!! Checkd ur site accidentaly while I was lloking recipes for my toddler and I was vry amazed and tempted by seeing such beautiful pictures n descriptions which like icing on the cake..I checkd ur site last ngt only and couldn't stopd myself frm trying vanilla custard cake and a mix veg and a moongdal (south indian style) I guess and it was amazing. But the problem is I'm using microwave for baking so can u please suggest whther I shld bake on convetion mode or normal microwave as cake was over baked n it turned hard from edges. I'm n love wid ur site and planing to try all recipes asap. Thnz a ton for creatng such a beautiful site wid so many emotions. Cheers n chudos to u ..
Ramya: Nice to hear from you! Look forward to your feedback on this pie if you happen to try it. Ruchika: I never ever use a microwave oven even for heating and I wouldnt even dare to bake or cook in it. Please invest in an oven. It will serve you well if you plan to bake in the long run. Appreciate your kind words and look forward to heaing more from you. Will note your recipe requests for sure. Neel: The yogurt helps in making the pie crust flaky and tender. Saumya: 1/8 rsp is just a pinch of soda. I hope you enjoy making your pie! I totally agree about the great dread about making pies at home…but yea once you taste the first success of getting the pie right..it is a forward going journey :). Would not mind a piece of that at all :). Have been following your blog for quite sometime now, have also tried a few of your recipes. Love the way you write and especially your pictures. Have always wanted to try an apple pie but my oven has a maximum temperature of 200 degrees. Is it fine if I bake this pie at 200 for little longer or what kind of adjustments should I make? Can't tell you how good this turned out!! It was perfection-personified – the taste, texture, aromas, visual appeal! Sreemathy: Yes you can bake it at 200C until its done. Anu, can I use a microvawe convection oven for baking? I have a Samsung convection oven. Anu, can I use a convection oven for baking? I have a Samsung convection oven. God bless you! Thank you so much for this superb recipie! My children simply loved it. Can't believe I actually made an apple pie….! Pravina: That is where the delciousness of this pie is hidden. I cant thank you enough for this recipe! Followed all the measurements as instructed and the best part was how crispy the crust was at the same time it wasn't brittle. Also I made it in an air-fryer so it took half the time yet the result was sheer perfection! Radhika- I'm so happy to hear that! I learnt baking after my marriage and since then have developed a liking towards baking. I started visiting blogs and looking at videos to enhance my baking skills. Master chef, cooking shows and others have fueled this passion. However, I faced one glitch every time. 99% of the recipes call for eggs. If the recipes are eggless, they stick to the traditional Vanilla and chocolate cake. Your eggless baking recipes come as a hope to all vegetarians, that delicious and mouth watering desserts can be eggless. Hope to see many more exotic eggless recipes.